Early Bird registration for the 6th International Urban Sketchers Symposium in Singapore is on now! Standard registration begins April 11. 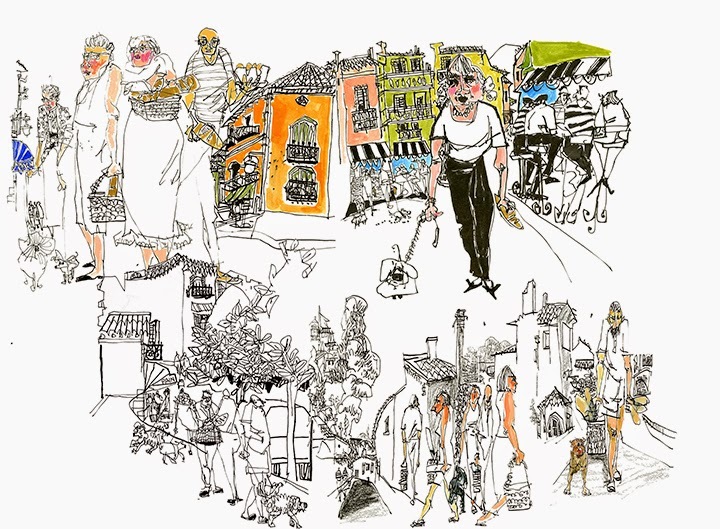 "Omar Jaramillo (USk Berlin) has done a fantastic job of developing sponsorship opportunities for the International Urban Sketching Symposium and establishing relationships with sponsors worldwide," said USk Board President Elizabeth Alley. "Omar has decided to step down from the Executive Board but will continue to serve as the Sponsor Coordinator. Thank you so much, Omar!" Urban Sketchers workshops around the world are filling fast! See the Urban Sketchers blog for details on workshops in Richmond, Virginia (USA), Coventry, England, Lisbon, Portugal, Miami, Florida (USA), and Volterra, Tuscany (Italy). "Line to Color" in Orange County, California (USA), is now full. As part of its biannual in-person meeting in Azores, Portugal, the Urban Sketchers Executive Board held its first live chat sessions with sketchers March 2 on Facebook. Held twice that day to reach as many urban sketchers as possible, the hour-long chats accepted questions and comments with responses from the board. "There were lots of great (hard) questions asked [and] good ideas," said Communications Director Brenda Murray. "It was so cool to see the interest from our sketching community." The board hopes to offer more online chats in the future. Have you heard about the new Urban Sketchers editorial guidelines? 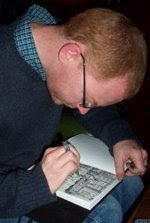 Any sketcher who regularly publishes on a regional Urban Sketchers blog can now be listed on the global USk Correspondents page and be recognized as an Urban Sketchers correspondent. This means that more sketchers will have their work exposed to a worldwide audience. "With more correspondents in more places, we can do a better job of fulfilling our mission of showing the world in sketches," said Editorial Director Gabi Campanario. Learn more about the new editorial guidelines. The Feb. 20 edition of the online magazine Creative Bloq featured an article about the 2013 Urban Sketchers Symposium in Barcelona. 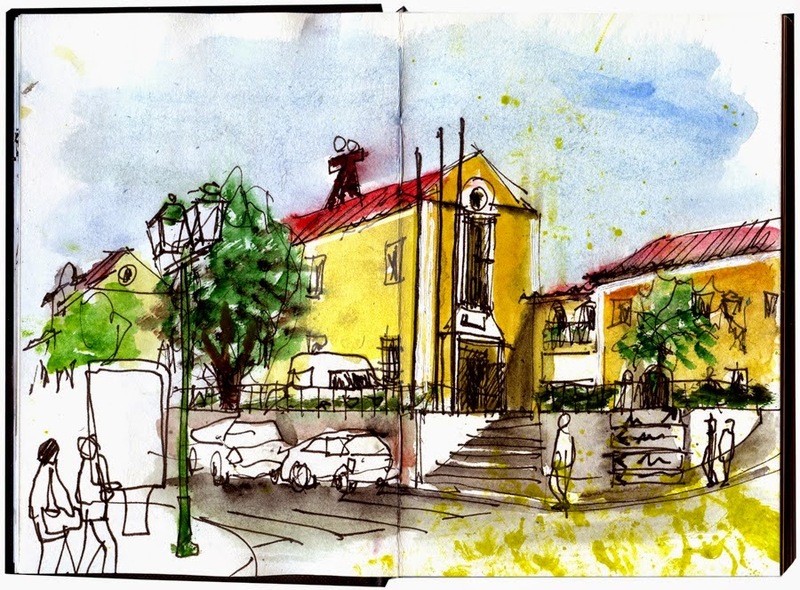 Urban Sketchers Brazil and the sketches of Flavio Ricardo were in the news March 23 in an article about Sketchy Hour, an event organized by Daniela Hladkyi of São Carlos. The Stewart Hall Gallery in Pointe Claire will present "A Sketch in Time," an exhibit of four artists from Urban Sketchers Montreal (Canada). Shari Blaukopf, Jane Hannah, Marc Holmes and Raynald Murphy will exhibit their sketchbooks and recent paintings in the Project Room of the Gallery July 5 through August 31, said Shari. On July 5, the gallery will also host a sketching day with the public and Urban Sketchers Montreal on the spectacular lakeside grounds of Stewart Hall Park, followed by an exhibit of the day's sketches in the Art Gallery. The Tri-City Herald (USA) gave Urban Sketchers Tri-Cities great coverage March 15. The article includes photos from a recent sketchcrawl in Richland's John Dam Plaza. A video of the outing features Jim Bumgarner. On March 6, the Record newspaper (Kitchener-Waterloo, Canada) featured KW Urban Sketchers' role in ending the $59/day permit that used to be required of street musicians and other performers. A May 30 event called "Permitted" will celebrate the permitting change, encouraging artists and performers of all kinds, including sketchers, to make music and art in the streets. Cathy Johnson has an interesting way to bring together far-scattered urban sketchers from the U.S. Midwest region. 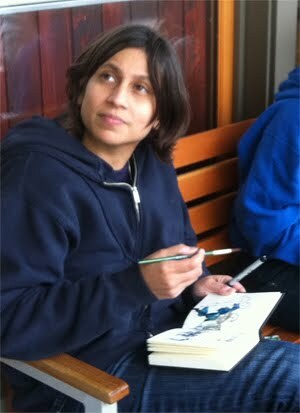 "I came up with the idea of having a Virtual Sketchcrawl on the third Saturday of every month," Cathy said. "People sketch wherever they are, and then share it with a #virtualsketchcrawl hashtag. We've been doing it for three months now, and it works beautifully!" A small local group meets in person also. See the group's Facebook page for sketches from a recent virtual event. Andre Sandmann of Zurich (Switzerland) reports that the Foundation Beyeler in Basel will sponsor a sketchcrawl in conjunction with the museum's annual summer open house party Sept. 15. 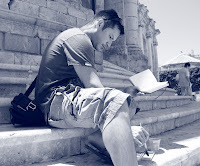 As part of the program, Andre will offer a workshop and presentation about Urban Sketchers. Andre also said that Swiss National Television recently televised a program about Urban Sketchers. Richard Alomar of Urban Sketchers New York City (USA) is working with the American Society of Landscape Architects and Urban Sketchers to organize SKETCH OUT/LOUD in April. Part of World Landscape Architecture Month, the month-long event is intended to promote urban sketching among landscape architects, architects and designers worldwide. All urban sketchers are invited to participate by adding the hashtag #skol2015 to sketches of parks, plazas, streets, front yards and other examples of landscaping. Tim Richardson of USk Birmingham reports that the group's blog was recently updated. "We've started putting book reviews on there, and it's become very popular," Richard said. The blog also shows the contents of members' sketch kits and sketching tips. Another USk blog that offers inspiring posts is Urban Sketchers Chicago. A recent post, "Lessons From Your Own Sketchbooks," by Andrew Banks, encourages sketchers to learn from and be inspired by their own past work. Urban Sketchers Málaga (Spain) is back in the news with an article in the March 2 edition of SUR. An image from "Sketching the Line"
Also in the press recently was Urban Sketchers Stuttgart (Germany). On March 10, the Stuttgarter-Zeitung featured the group sketching at the natural history museum in Rosenstein Park. 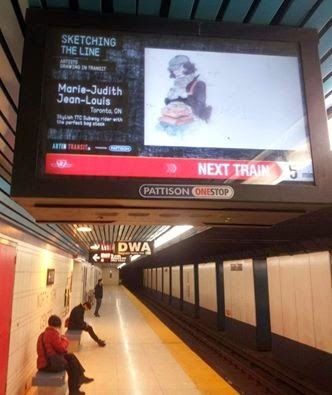 For the second consecutive year, "Sketching the Line," an international exhibition of sketches of commuters by commuters, selected sketches to display on digital screens in the Toronto Transit Commission subway stations and the Edmonton Light Rail Transit stations, reports Marie-Judith Jean-Louis. This year, three of the ten selected sketchers were from Toronto: Marek Badzynski, Marie-Judith Jean-Louis and Wilfred Wong. Other artists include Tony Yin Tak Chu (Canada), Deborah Dendler (USA), Robert Guenther (Germany), Kathleen Newman (Canada), Vincent Roche (Canada), Louise Wilde (UK) and Nick Wildermuth (USA). The Virginia Center for Architecture is sponsoring "Urban Sketchers: Sketch Virginia," an exhibit in partnership with Urban Sketchers and Glave & Holmes Architecture. Featured sketchers will include Rich Johnson and Midwest correspondent Don Gore. Marc Taro Holmes will lead a series of workshops the weekend of April 17. Curated by USk Membership Director Jessie Chapman, the exhibit runs April 9 through July 5 at the VCA in Richmond (USA). Matthew Brehm (Idaho, USA) has just won the prestigious Award of Excellence from the American Society of Architectural Illustrators for his watercolor sketch of Via del'Arco di San Calisto in Rome, Italy. Richard Alomar (USA) will give a presentation on "Urban Sketching: Decoding Place" at the Foundations in Art: Theory and Education National Conference in Indianapolis, Indiana. Eduardo Salavisa of Abrantes, Portugal, has an exhibit of 90 images from his sketchbooks as well as 72 of the sketchbooks themselves. Entitled "The Sketchbook. Being aware of what surrounds us," the exhibit is on through May 2 at the Abrantes municipal library. San Francisco (USA) urban sketcher Cathy McAuliffe recently sketched the installation of Richard Serra's sculpture at the SF Museum of Modern Art. As she sketched, a San Francisco Chronicle photographer captured her sketching, and her photo was included in an article about Serra's work. Liz Steel (Australia) will offer a travel sketching workshop in Launceston, Tasmania, in October. Melanie Reim's reportage sketches of a dog show. New York (USA) artist Melanie Reim has been keeping busy! 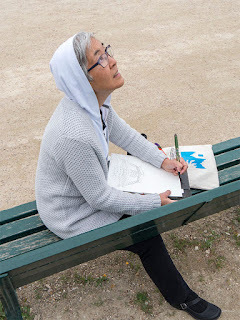 Her reportage drawings are appearing in several group shows. Chiens et Pain, drawings from early mornings in Collioure, in the south of France, are in Mascot Gallery, New York City, 16th annual Dog Show, and in New Views: FIT Art and Design Faculty Show, Fashion Institute of Technology, also in NYC. Her reportage drawing of the USS Intrepid has been accepted into the Society of Illustrators West Annual Exhibition, a juried show. 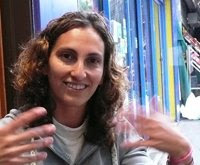 And finally, Melanie was recently featured in DART, the Design Arts Daily online publication.